In the port of La Ciotat on the Cote d'Azur, a stiff breeze whistles through the rigging. Even big and heavy yachts are heeling under bare poles. When the Mistral hits at full force in the spring, you'd better batten down the hatches. Hence Beneteau canceled the sailing portion for the day, but that was just as well because the forecast said it'll ease some the following day. A spin in heavy air would have been intriguing indeed, since the Sense 55 obviously is a large, heavy yacht that inspires confidence, a real cruiser with plenty of freeboard and a deep well-protected cockpit. 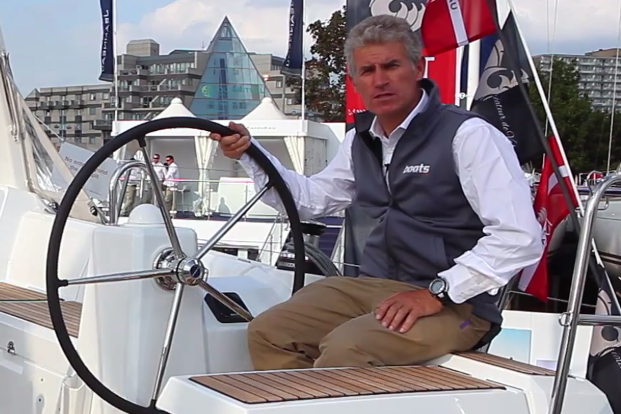 In addition, the boats of market leader Beneteau's fairly new and exclusive Sense model line have a reputation for pretty good performance. After two light-air tests with the smaller models Sense 50 and Sense 43, our testers were itching to confirm this in a blow. Meanwhile there was plenty of time to check out the special interior of the Sense. 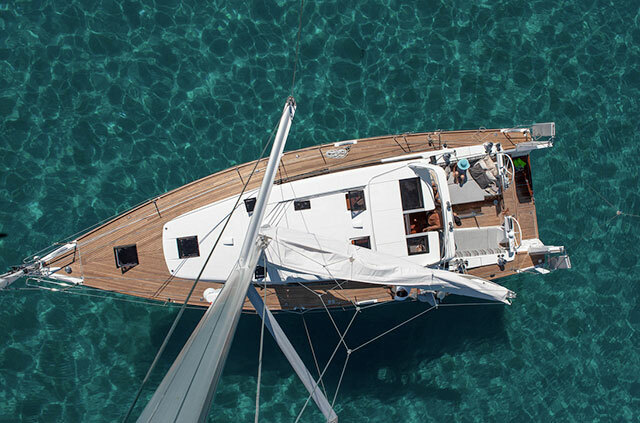 About two years ago, Beneteau introduced the new and unusual design, an ambitious and courageous move with the idea of living, sleeping and relaxing in the forward area, working, sailing and socialising aft. This arrangement required giving up entirely on any interior aft of the cockpit bulkhead, including aft cabins, which simply don't exist on Beneteau Sense models. Hence the cockpit can be much lower than on boats with conventional layouts. In turn, the saloon is elevated a little bit, which fuses interior and exterior like on cruising catamarans and power boats. 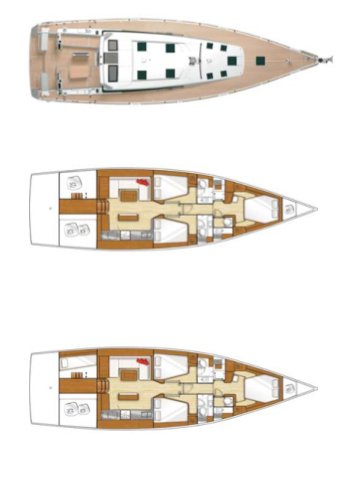 However, the spatial and functional integration of saloon and aft-cockpit on one level isn't completely new on monohulls: In 1998, Dufour tried it on the Atoll 43, but this 'monomaran', a mix of catamaran and monohull, never caught on. 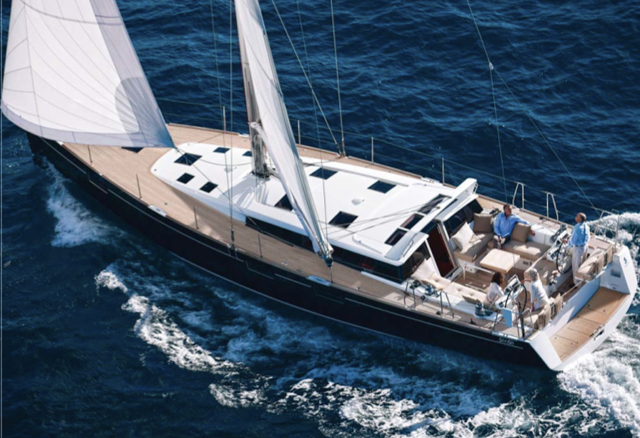 More successful are the somewhat unconventional but intriguing deck salon-yachts Moody 45 and 62 by Hanse, with nearly all of the interior and exterior on the same level. The Sense is a compromise, not quite monomaran, not quite deck salon, but also not a conventional aft-cockpit yacht. On these boats you still have a step down into the saloon, but on the Sense 55 that step is only 80 centimetres, while on conventional boats of similar size the difference in the two levels can be 1.5 metres and even more on center cockpit yachts. Such vessels are referred to as 'basement boats' with steep companionway steps that are often tedious to negotiate. On the Sense-models the passage is shallow with three steps and could be called an 'entrance'. 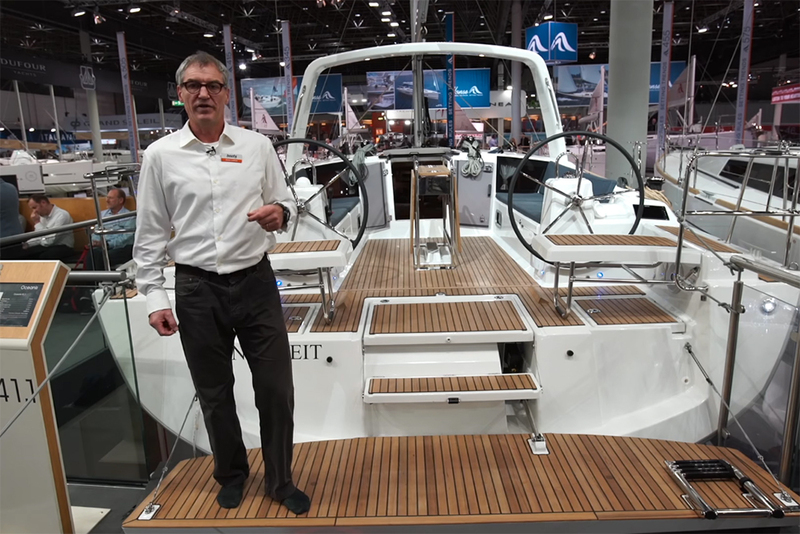 Beneteau's concept here is addressing owners who like to spend more time on their boats, primarily in warmer climes. The communication between cockpit and saloon is uninhibited, and the distances are much shorter than on conventional boats, which is especially noticeable when the meal is prepared in the galley and the table is set in the cockpit. The visual connection is good as well. The large windows in the hull, the cabin and the aft bulkhead of the cabin inform the inside-dwellers about the goings on on outside and vice-versa. This is the kind of transparency and flow customers might have experienced on charter vacations on cruising catamarans. The Sense models are boats for the Med as evidenced by the asymmetrical cockpit arrangement and the U-shaped settee around a table that can be lowered to create an impressive lounging area (2.3 x 1.3 metres) for sunbathing. The insert cushions are supplied with the standard boat's equipment. This kind of cockpit layout seems to be the trend of the time. Bavaria's Vision 46 (see Bavaria Vision 46: First of a new generation of deck saloon cruisers) offers a similar appointment with an optional lounging area. Also noteworthy is the access to the water. The low cockpit of the Sense 55 made the fold-down swim platform obsolete, which is standard issue on conventional boats of this size. Via the boat's modestly stepped stern, access to the water and to the dock in port is a cinch. The helm seats fold up, which turns the stern into a small swim dock. Large hatches for storage are built in to the stern to accommodate scuba gear and water toys. But an open stern is not everybody's favorite, especially when under way. 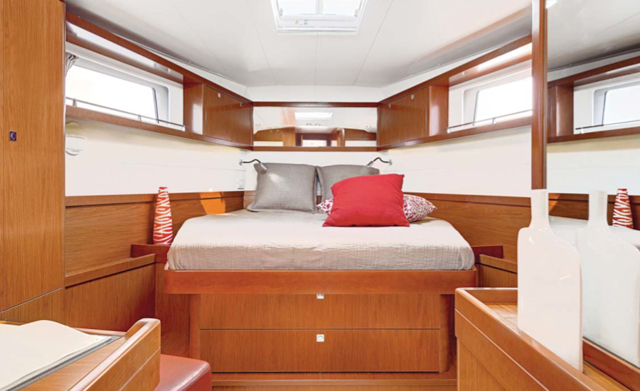 Therefore Beneteau offers a partition that can be added when sailing with family and children. The absence of the interior in the stern leaves more space for storage than on other boats. Bulky items like folding bikes, easily fit into the boxes under the cockpit thwarts. These spaces are also easy to access for repairs and maintenance of the on-board systems. The entire electrical and steering gear, the Yanmar engine and the Saildrive propulsion unit are easy to reach through numerous hatches and openings. It's a pleasure to note the clean implementation and finish of the technical installations. The helm seats fold up, which turns the stern into a small swim dock. Large hatches for storage are built in to the stern to accommodate scuba gear and water toys. As promised by the weatherman, the Mistral backed off quite a bit the next day. Even though it blew 25 and more in the gusts, conditions permitted sailing even though the mainsail was reduced to the No. 2 reef. This procedure is rather easy on the Sense 55. Control-lines and halyards are led aft in orderly fashion to the large winches on the flat coaming. There's plenty of visibility and the sheet tails disappear in large cubbies. The standard genoa with 105 per cent overlap was only furled for a little bit. Later it became evident that the boat handles the puffs very well with the complete headsail area. For heavy-air venues an optional self tending jib is available. At an average wind speed of 20 knots, the Sense 55 sailed to weather at 7.5 knots and a 40-degree true wind angle, which are both respectable performance numbers. 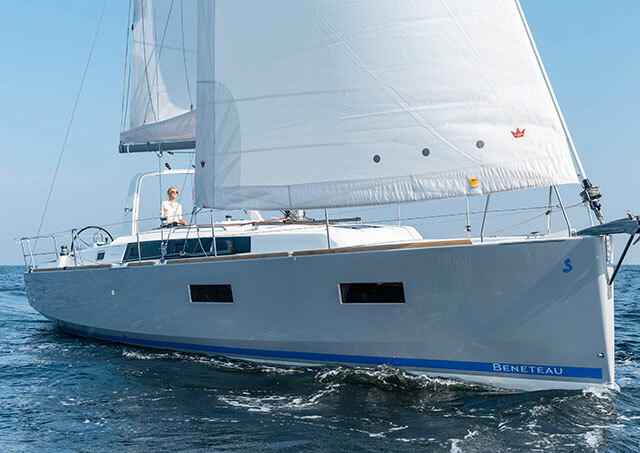 Her true colours became evident on deeper courses with the sheets cracked off when the speedo of this 18.5-ton boat hit 10 knots, while it was easy to keep the Berret-Racoupeau design in the groove. The twin rudders under the wide stern help keep control, while the hard chines add stiffness under sail. Boat handling during manoeuvres also is unproblematic, even for small crews. However, the prerequisite is a rather pricey option that includes electric winches. Sheets, halyards and control lines are tucked away inside the coachroof and are led through blocks and three near 90-degree-turns. Accordingly, friction and exertion are high. The interior of the flagship of the Sense series essentially was adopted from the smaller models. 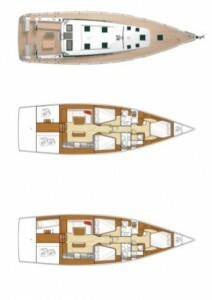 Saloon, inline-pantry and the nav desk that is attached to the aft cabin bulkhead are one integrated functional unit. Leading forward is a long corridor, past two roomy double guest cabins with en-suite heads. The owner's state room is all the way forward with two separate spaces for shower and toilet. There are no alternatives to this arrangement of three cabins and three lavatories. One of the dominant design characteristics are the generously sized windows, both in the cabin top and the hull. Sitting or standing up in the saloon one can watch the surroundings in port as if in a movie theatre. In addition to plenty of light there is also plenty of fresh air for ventilation. Large hatches, skylights and opening ports boost circulation. The amount of storage space on the Sense 55 is overwhelming, which should not surprise on a vessel of this calibre. Arrangement and access are exemplary. 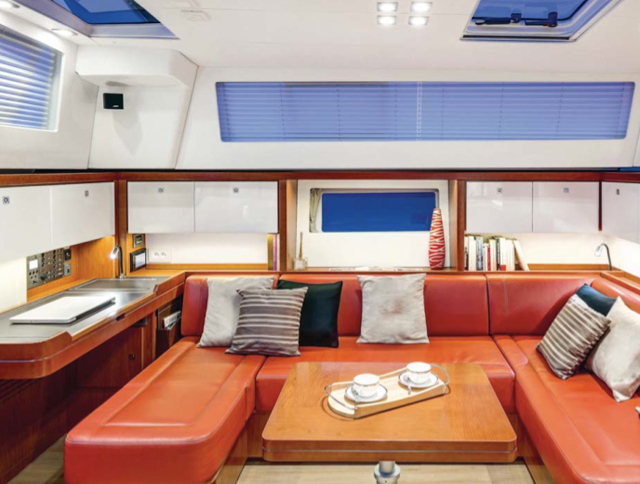 A rarely seen feature is the fold-out area of the berth in the owner's cabin with easy access to storage space that is smartly divided. €380,000 is the base price of the Sense 55, €398,650 including the electronic Dock & Go docking aid with the swiveling saildrive and bowthruster. The evaluation of this price is a bit difficult, because many boats in the same category are either custom or semi-custom concepts, which have to be calculated differently. 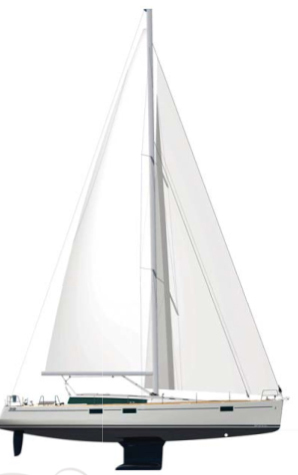 The most plausible comparison is the Oceanis 54 from the same manufacturer. 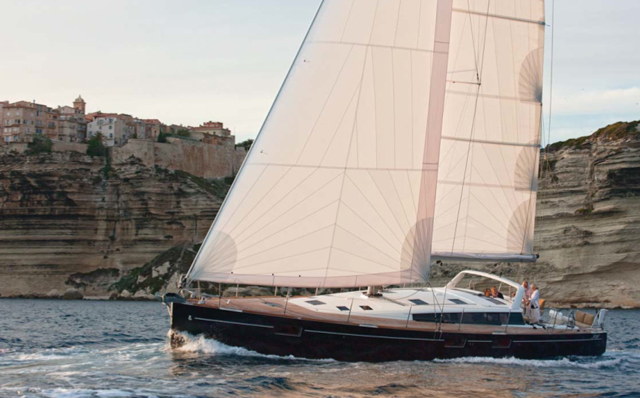 This boat, considered an affordable cruiser, is priced at €356,000, which is €25,000 less than the Sense 55. Some might have laughed about the Sense line in the beginning and not all the critique was positive at the time of the launch. But in the meantime it looks like Beneteau's courage is paying dividends. The production lines for all models are running at full speed, according to the company, and there's a wait for new orders. Maybe the concept of the Sense doesn't strike a chord with everyone, but those who'd been waiting for it, were rewarded for their patience.